This steel twister is great if you're looking for a unique look in a variety of piercings. 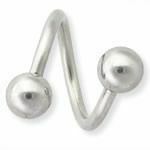 The twister can be worn in a variety of ear piercings, including cartilage, helix, and more. The twister is 14g (1.6mm) and comes with two 5mm balls.